Does your team use information about what’s happening, right now, to make crucial operational decisions? If so, then you rely on situational awareness (SA), an essential capability for organizations across a wide array of industries. And yet not all teams have a strategy or tool in place to actually ensure that the right information reaches decision-makers at the right time. If improving situational awareness is crucial to your mission, you might consider implementing a comprehensive situational awareness software platform. Situational awareness as a concept first arose in the military, where the stakes for slow or ill-informed action can mean life or death. Today, enterprises, public safety organizations, shipping and logistics companies and more have adopted the concept to evaluate and optimize their internal processes. Nearly every industry can (and do) benefit from improved situational awareness — only most haven’t implemented software designed for exactly that purpose. Situational awareness will always rely on the actions of talented individuals and teams. But that isn’t enough in this day and age. Increasingly, it’s clear that technologies will form a sort of “fifth limb” or “sixth sense” for human actors, and that these technologies will be necessary components of an effective overall strategy. That means implementing situational awareness software and the technological infrastructure that supports it. Situational awareness software unites data from a range of sources and delivers actionable intelligence in an easily-digestible format to the people that need it. Ideally that information arrives in real-time, reflecting ongoing “situational” changes; and ideally that intel is made accessible to the people that need it via a common operational picture. SA software typically deals with information relating to critical situations — relevant objects, people, assets, and environmental conditions. SA platforms tend to deliver this information by way of visualization, which means that users can glance at, for example, an annotated digital map (GIS) and receive relevant, immediately-understandable inputs that help them take action — with as much speed and as much crucial information as possible. 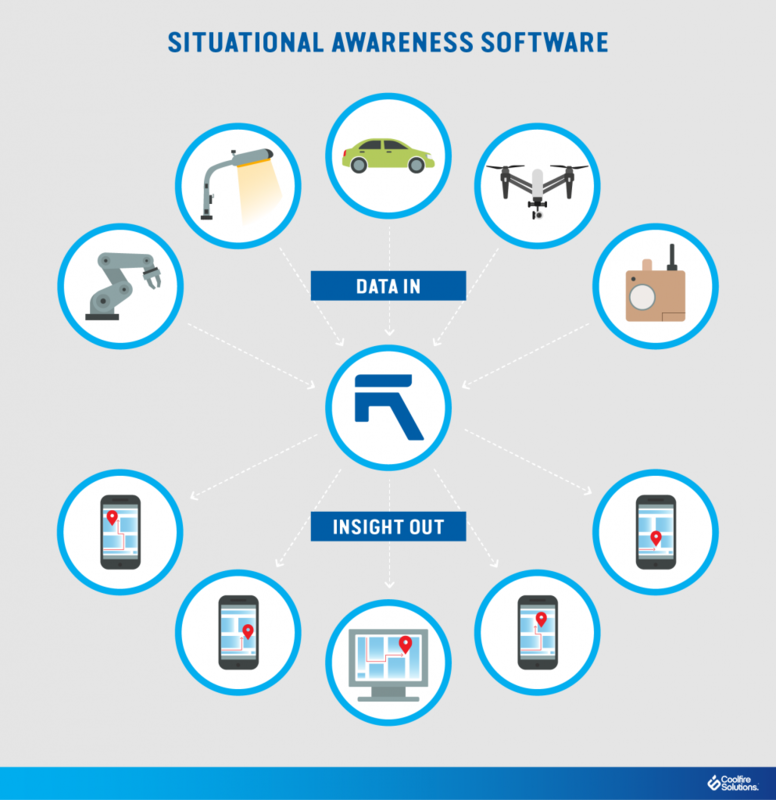 What are the Benefits of Situational Awareness Software? SA software enables insights far beyond what humans alone can deliver, providing a much more comprehensive understanding of an environment. With software, it’s possible to extend the capabilities of the team (and technologies) you already have in place, in effect setting up additional eyes and ears to monitor and react to evolving situations. And in some cases, SA platforms can deliver insights that humans simply can’t match — like the certainty that a detected gas is dangerous, or that a loud noise is a gunshot and not a truck backfiring. Another critical component of situational awareness is timing. In many scenarios, viewing a status change five minutes after the fact is just too little too late — response time needs to be immediate. With SA software, data can be delivered to users in real time. This speed represents an almost priceless advantage in situations where response times correlate exponentially with outcomes. How Do Technologies Enable Situational Awareness Software? The foundation of situational awareness is the ability to perceive elements relevant to the current situation. But a visual scan of a situation is rarely enough, and taking individual measurements is too slow. Situational awareness technologies, like connected cameras, sensors, drones, and GIS, supplement humanity’s natural abilities and acting as a force multiplier. Organizations can set up a range of easily-implemented low-power Internet of Things devices to track specific types of situational criteria. Edge computing, meanwhile, allows some of these devices to process and analyze information on the device itself, reducing latency and delivering readable information to the SA platform (and those of its users that need it) in real-time. For instance, a stadium security team might traditionally rely on posted guards to keep an eye on crowds. Another team member might watch CCTV in a command room. But only additional technologies — gunshot sensors, motion detectors, facial recognition scanners — can expand and automate responses to these crises even before they occur. Such technologies can also enable a faster, smarter response if an emergency does happen, instantaneously transmitting information (i.e. gunshot position and type, crowd movements, persons of interest) to individuals who can make use of it. A growing number of software solutions designed to enable situational awareness are coming to market. Many of these are designed for military, law enforcement, and security applications. But the wider range of use cases to which SA software can be applied have yet to be fully explored. Enterprise Rent-A-Car has convincingly demonstrated the ease with which these tools can assume core operational functions when deployed into new environments. When it’s well-executed, situational awareness software should be able to deliver a jump step in operational visibility. When it’s designed for flexibility, scalability, interoperability, and extensibility, it should fundamentally transform how organizations operate.